Will you regularly drive over 180 miles/day? Will you use the Tesla for a road trip car? If the answer to BOTH those questions is "No", get the 60 kwh. Period. Done. The 60 has comparable real world performance to the 85 and reportedly feels even more spirited because of less battery weight (though ballasted to match an 85, the ballast is apparently located differently somehow, according to reports from people who have driven both). The 60 is a SUPERB in-town commuter car or medium distance tourer (with destination charging). If EITHER those questions are answered with a "Yes", get the 85kwh. By the time you pay the extra $2k to enable the Supercharging option on a 60 you've already started toward an 85 anyway. Like the evil dojo master in Karate Kid said, "Finish him!" Get an 85. Now don't go crazy right to the P85+, let's look at the upper extreme first. The P85+ is apparently designed solely for the purpose of destroying tires... rear tires... every 5000 miles... or less. Unless you're coming from a high performance car or plan to enjoy track days, fuggeddaboutit. It's basically an even MORE expensive version of the P85 with staggered tires and other suspension tricks. Real world, this is overkill and more about badge ego than useful value (for the vast majority of non-professional racing drivers). Speaking of real world, the performance difference for the P85 and the S85 exists primarily in ONE place: 0-30mph. That's it. From 30mph and up they are virtually identical and both will silently roar around slower traffic with equal capability. Originally the P85 upgrade only came with some other standard features that are a mixed bag (to me). Thankfully Tesla has decided to allow buyers the option of upgrading ONLY the drivetrain. Still, that presents some problems. A P85 with the 19" wheels just overwhelms them. Remember the only performance advantage it has is 0-30 and that requires GRIP to actually enjoy it. For a variety of reasons (but chief among them rolling resistance and wind resistance) Tesla's tires are taller rather than wider to increase their contact patch. A traditional sports sedan would get wider tires to increase grip but the Model S gets taller tires... ergo, a P85 on 19s just bounces off the traction control CONSTANTLY. In a sunny climate that might not happen as often but here in pothole country you'll get clunks and shudders from way back there at the wheels all the time as the traction control tries to reign in your lunacy. Jake and I had several days with a silver loaner (read more about it here) and it was fun but also frustrating. Unfortunately, if you're living anywhere with four seasons you are NOT going to want to alleviate the traction problem by getting 21" wheels. We have potholes. LOTS of them. BIG ones. And bridges with expansion joints that will turn those wheels into ovals. You know how when you go to the grocery store you always get a cart with that annoying wobbly wheel? Would you like to buy one for $90-100K? I didn't think so. Speaking of expenses-- many P85 owners report higher than average tire wear (regardless of wheel size). I don't know of a true head-to-head drag race video of all THREE versions of the Model S (60/85/P85)-- amazed no one has done it yet-- but the video above is very recent and posts a time faster than the Tesla website does. You can read more opinions on that video HERE. Another recent video does offer a head-to-head of a standard S85 vs a P85 and you can see that after the first 30 feet or so, the S85 and the P85 match stride-for-stride. In fact, at the end of the 1/4 the trap speed on the standard 85 is actually higher. Skip ahead 26 seconds to catch the Tesla family feud. One long-time P85 owner asserts the difference in launch speed really only exists at higher states of charge. As a result, maintaining that performance edge over the S85 requires more frequent and fuller charges of the main pack, potentially increasing long-term degradation. Ironically, the only times you really SHOULD charge the pack up to higher levels (for distance), you wouldn't want to enjoy the harder launches because it would adversely affect your range. So the S85 is a tad slower off the line. No one but a P85 owner is ever going to know that. And, frankly, the power delivery at launch is a lot smoother. The P85 is pretty brutal. Oh, it's damn impressive-- but it's also jarring. I like the slightly tapered building on of WHOOSH that I get from the S85. I think it keeps my wife from realizing how often I'm toying with the other cars around us. James Bond, after all, wears a suit... not a karategi. <--- brought that back to Karate Kid nicely, didn't I? I have no idea why either. Clearly I could go on and on about my configuration thought processes-- and how they've evolved since taking delivery-- but that's a topic for another time. 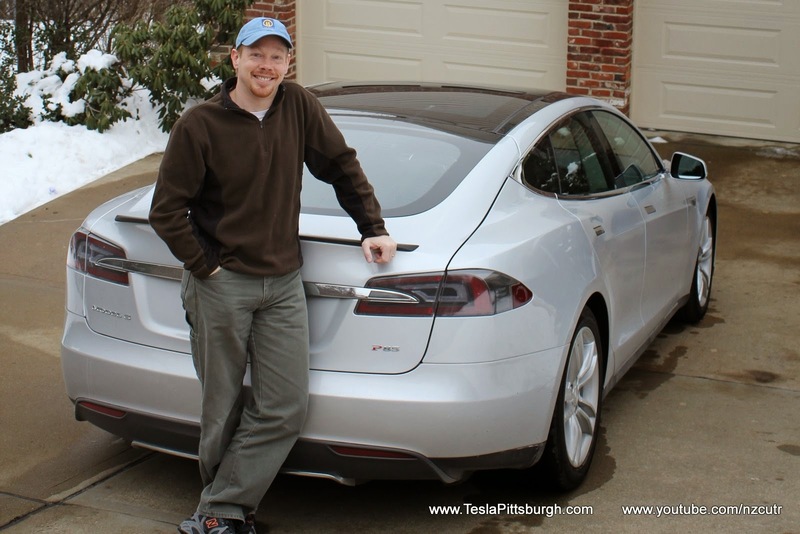 If you haven't already read about my "Journey to Tesla" then check it out for some insights into how I got this car in my driveway and how you can too. It starts by clicking RIGHT HERE. So you would recommend a S85 in Pittsburgh for winter driving? Do you know if snow tires are needed? Certainly the extra torque of the P85 would be of no use at all in any winter driving. I think if you lived somewhere with flatter terrain you could probably get by with all-season tires but I'm not willing to risk my "investment" on the steep slopes of Pittsburgh which are frequently snowed and iced upon. So yes, I think dedicated tires in the 'burgh are a required and relatively minor expense compared to the replacement cost of the car.